Organising hui for Te Kahui Amorangi. 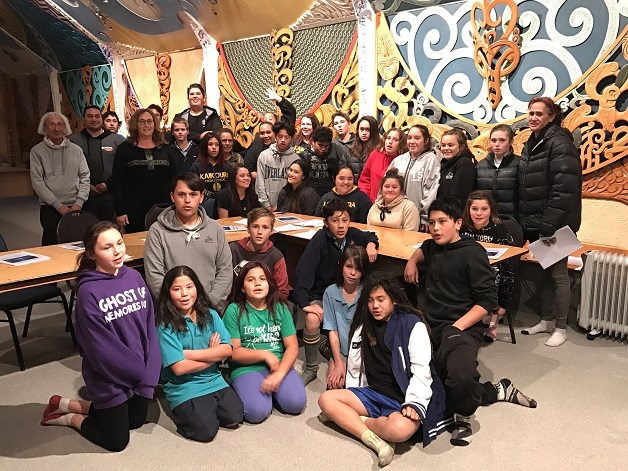 Earlier this year Te Rūnanga o Ngāi Tahu announced they would match funding with the Ministry of Youth Development (MYD) to provide $100,000 of programme support to Ngāi Tahu rangatahi. The agreement saw the Government and Te Rūnanga o Ngāi Tahu each invest $50,000 in a pilot programme to grow youth development opportunities. The following initiatives were funded through the programme Rakatahi Reo, Rangatahi Tū Meke, Manawa Hou, Rangatahi Hangarau, Tū Toka Tū Ariki, Ka Pū te Ruha, and Te Kahui Amorangi. Lynne Te Aika, General Manager – Te Taumatua, Te Rūnanga o Ngāi Tahu says the pilot has allowed us to develop collaborative relationships within the office and community to reach Ngāi Tahu rangatahi across the takiwā. “All of the programmes gave rangatahi the opportunity to grow their cultural, technological, and leadership capacity,” says Lynne. One of the successes was Te Kahui Amorangi. Te Kahui Amorangi , or cluster of chiefs, saw a group of rangatahi put together the 2017 Matariki festival in Kaikōura. The programme gave rangatahi the opportunity to develop their leadership capabilities, learn more about matariki and further connect to their cultural identity. The event also gave rangatahi the opportunity to understand the significant planning that goes into a community event. Kaitoko Mātauranga ki Kaikōura Rawiri Manawatu says over 600 people attended which included 11 Schools, 3 Early childhood centres, whānau and the community. “The event ended with an outstanding performance from Te Kāhui Amorangi themselves singing waiata they had learnt during their wānanga that connected them to their taha Māori and also gave them the opportunity show case their newly developed skills as the next generation of Māori leaders,” says Rawiri. “The response and enthusiasm from rangatahi was overwhelming with the numbers really growing from the involvement of Kaikōura High School,” he says. Rawiri says he thinks the children’s curiosity has been piqued by stories of past leaders within the tribal area of Ngāti Kuri, including the explorer Tu Te Urutira, the great great grandson of Kuri, and the great innovator and strategist Marukaitātea. “There’s a lot of enthusiasm and their parents tell me they love it,” he says. “The kids did all the organising – hosted the event, and helped to plan and organise all the activities,” says Rawiri. Whānau at Rangatahi Tumeke this year. 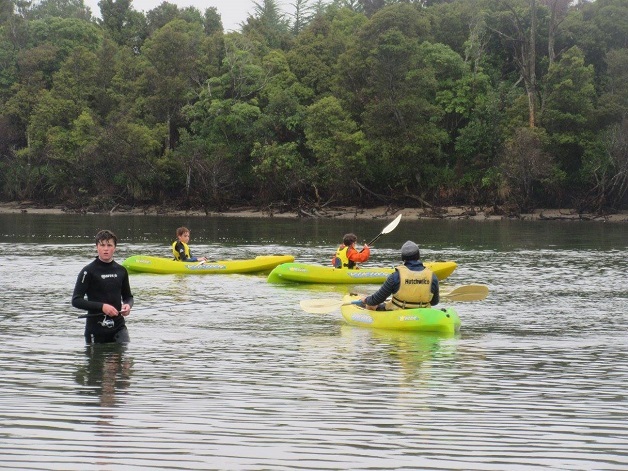 Another great success from the funding partnership is Rangatahi Tumeke, an outdoor rangatahi camp based at Te Ākau Tai Toka (the Catlins). Twenty eight Ngāi Tahu rangatahi, aged 12-17, attended the camp and Stephanie Blair, Project Manager (Kaihautu) , says the programme gives rangatahi the opportunity to get outdoors in a learning environment, encourages leadership skills and enhances their cultural knowledge in a whānau context. “The programme is based around traditional mahinga kai practices and it gives rangatahi the opportunity to connect with Te Ao Tūroa,” says Stephanie. Some of the kaupapa rangatahi engage in while on the camp are; fishing / eeling, kayaking, Te Reo Maori Kapahaka , Waiata , gathering kaimoana, tenting, hiking, raranga, bone carving, waka ama , cooking , manaakitanga , whanaungatanga and hauora healthy options. “The rangatahi really get a lot of this programme but the key thing I see is a sense of belonging. That is a belonging within themselves that connects them back to the environment and their Tupuna ” says Stephanie. Stephanie goes on to say that without the support of the whānau and the community none of this would be possible. “whānau are right there through the programme and they provide great support,” she says.